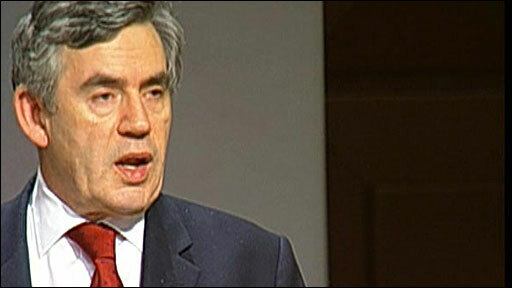 Gordon Brown has called for a "new deal" on energy at talks in Saudi Arabia on the high price of oil. The prime minister wants oil producers to invest in a £100bn drive towards long-term energy projects in Britain, such as wind farms and nuclear power. 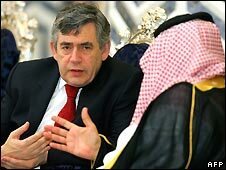 At the Jeddah Energy Meeting, Mr Brown also pressed for an increase in oil production to help bring down prices. The Conservatives said Mr Brown did not understand the oil market. The Lib Dems said he was in "cloud cuckoo land". Mr Brown said the world is experiencing "the third great oil shock in as many decades", hitting living standards. Oil prices touched close to $140 a barrel in New York last week. Mr Brown said major producing countries accepted for the first time that prices were too high. "What we have got is an agreement here - perhaps for the first time - that the oil price is too high and it is detrimental, it is causing damage and that there must be more investment in the supply of oil immediately and for future years," he said. And he called for action to make sure the international oil market functioned more efficiently. "Wherever there are shortages and gaps, they are addressed," he said. "Wherever there are investment bottlenecks they are dealt with. Whenever there is protectionism it is tackled. So that instead of uncertainty and unpredictability there is greater certainty. And instead of instability there is greater stability." He also said that the UK would host a follow-up oil conference following the G8 meetings later this year. Mr Brown said the current crisis was worse than the one of the 1970s, and called for a "more balanced energy market". "We're living through the third big oil shock in 30 years. This is probably the most difficult one. Oil prices have trebled in every country of the world," Mr Brown said. Hope for PM's new deal on oil? He also said he wanted to reduce UK dependence on oil and called on oil-producing countries to invest in other forms of energy. "I want the oil-producing countries also to diversify out of oil and I want us to get a more balanced energy market, which will mean that all of us will be reducing our dependence on oil in the years to come." The prime minister said that the effect of the oil crisis was being felt by "everybody who's a consumer of oil, whether they are a driver with a car, or whether they have gas and electricity bills coming in". Mr Brown is facing public anger over the cripplingly high price of fuel, largely due to the cost of oil from the producers' cartel, the Organisation of Petroleum Exporting Countries (Opec). The UK, US and other consumers have urged Opec to boost supply, blaming lack of capacity for the recent price surge. However King Abdullah of Saudi Arabia has blamed price increases on speculators, a point he made when opening the Jeddah conference. Saudi Arabia has said it will step up production by 200,000 barrels to around 9.7 million barrels a day from July, and Kuwait says Opec members "will not hesitate" to increase production if the market needs it. Shadow secretary of state for business Alan Duncan told BBC One's Andrew Marr Show that Saudi Arabia could only increase production of a kind of oil which refineries did not have the capacity to deal with. "So the idea that Opec can just go like that and flood the market with oil and bring the price down, just shows that Gordon Brown does not understand global markets." Lib Dem leader Nick Clegg told BBC One's The Politics Show: "I think it's slightly humiliating to see the prime minister fly off at taxpayers' expense to Jeddah to announce some gimmick where he hopes Opec will fund wind farms in the UK. "He's living in cloud cuckoo land if he thinks that's a sustainable solution to the crisis." But Chancellor Alistair Darling told the Andrew Marr Show: "If the markets think that production will increase that will bring downward pressure on prices." Mr Brown said he wanted his Saudi hosts and the other big oil producers to consider putting some of the estimated $3 trillion they have made out of the recent "oil shock" into new nuclear technology. In Jeddah, Mr Brown urged joint ventures between Gulf producers - the United Arab Emirates, Abu Dhabi, and Qatar - and UK firms to invest in UK energy, including the next wave of nuclear power plants. Funding could either come directly or from the sovereign wealth funds of oil-rich Gulf states.